This first edition of the Eko U15 Secondary Schools Tennis Championship ended Saturday with accolades for the Organizers and sponsors. The Special guest of Honor Oba Saheed Ademola Elegushi poured encomiums on Mr Anthony Adeyinka Adeboye the Senior Special Assistant to the Governor of Lagos State Akinwunmi Ambode on Sports during the finals of the Eko U15 Secondary school Tennis Championship at the National Stadium Surulere Lagos on Saturday the 27th of February 2016.
empowerment. Stating that sports should be used as a veritable tool for keeping the youths of the country positively engaged. Austin Stephen made history as he emerged as the inaugural winner of the Eko U15 Secondary school Tennis Championship in two straight sets. He displayed an high level on intelligence that had the capacity crowd cheering every move. Stephen and defeated finalist Ayoola Micheal Gave a good account of themselves and they have both been drafted into the Lagos State Junior Tennis Team. 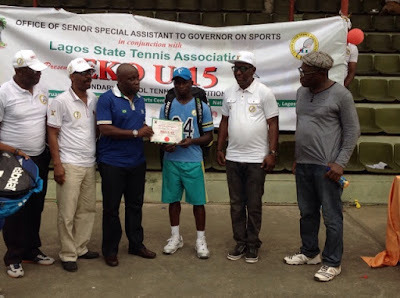 The final game was preceded by two exhibition matches between the Under 15 girls who will be part of the second edition, And the Adults were not left behind as the Chairman of the Lagos State Sport Writers Association (SWAN) Fred Edoreh also played an exhibition match with a Member of the Lagos Lawn Tennis Club. The chief Organizer of the Tennis Championship Mr Anthony Adeyinka Adeboye thanked the sponsors Winners Golden Bet for supporting the event while also calling on other Nigerian companies to come and join the Lagos state government, Adeboye revealed that the players were kitted by the sponsors and several players were provided training kits to help them improve the quality of their game. Adeboye promised to make the event an annual event, while revealing that his office would be organizing similar "Catch them young events" in several other other sports this year.